O Ku o Ka o Ku o Ka! 1908. The meeting of Kalaniopuu and Cook, 1867. The Era of Kalaniopuu, 1779. Pertaining to the Death of Captain Cook, that is Lono. On the 24th of January, Kalaniopuu and his warriors returned from Maui and landed at Awili in Kaawaloa, and stayed at Hanamua at Keaweaheulu’s place, but they were also on Maui at war with Kahekili. Wahi pana of Waipio, Hawaii, 1877. Our guide [W. A. Mio] asked him [unnamed person very familiar with the wahi pana of Waipio] to go with us and he agreed, and we moved on until we stood at the edge of the road beneath Koaekea, the road taken by Umi and his aikane, Piimaiwaa folks [that being Piimaiwaa and Omaokamau], and makai of there was the house foundation of Milu, that being Paoo; upon there is a rock with an indentation, where the liver of Milu was placed, taken by Kaalaeanuiahina and hidden there. Also upon there is where the palate [kileo] of Kihapu was broken because it was dropped from the mouth of Puapualenalena, the dog who fetched that conch, and it sounded, which is when the gods atop Hokuwelowelo guarding it heard. I will speak a little on that; Liloa had a awa patch in the uplands of Moomuku, and he was bewildered by the one who raided it, and after a constant watch, it was seen that it was a dog that was doing the stealing, and when the dog left with the awa, the men followed until they arrived at the residence of the keeper of the dog; the men returned to Liloa and told him they found the one who was stealing from his awa patch, that it was a dog and his keeper, in the mountains facing Waimea; that is when Liloa commanded his men to bring the awa thieves, and Liloa also ordered them to fetch them and bring them unharmed, and this order of the alii was carried out; the men arrived before the man and his dog, and they told him of words of the alii to come; the keeper of the dog agreed at once and he went and appeared before Liloa. Liloa asked, “Can your dog go and fetch the conch (Kihapu), because it is currently my great nemesis; and should it be gotten by your dog, then you and your dog will live;” however the keeper of the dog believed, as for Liloa’s words saying the two of them would die, that Liloa and his men would not be victorious over his dog, Puapualenalena. However, the keeper of the dog agreed and commanded his dog that he was to fetch it, and when Puapualenalena was coming back with Kihapu, a side of the conch hit the brow of a cliff, and that is why it fell and sounded, the kileo was broken, and the gods heard; he hastened, he was gone, and the gods were left frustrated. If you all have a desire to see Kihapu, go to Aliiolani Hale [Hawaiian National Museum], and you can see it in the room of glorious things. Directly below the road of Koaekea are the fishponds of Liloa, Lokoula and Laakea [Lalakea]; but Lokoula is covered up in sand, and upland of the ponds is the house site of Liloa. Ka Lahui Hawaii, Buke III, Helu 44, Aoao 2. Novemaba 1, 1877. 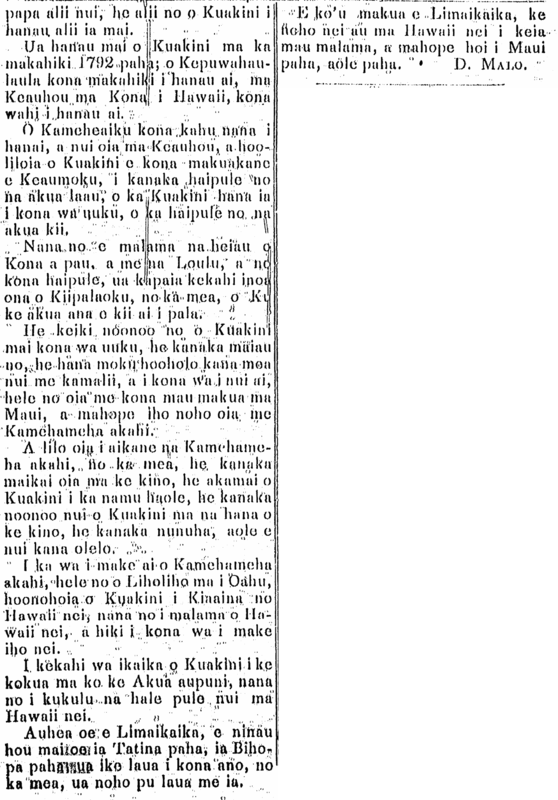 Kuakini, and Hawaiian tradition, 1845. Kuakini was the son of Keeaumoku, the son of Kalanikauleleiaiwi, the sister of Keawe. They are the royal ancestors of Hawaii Island’s high chiefs, Kuakini was befitting the class of high chiefs amongst Hawaii’s alii nui. …class of high chiefs; Kuakini was born as an alii. Kuakini was born in the year 1792 perhaps; he was born in the year of [battle of] Kepuwahaulaula; at Keauhou in Kona in Hawaii was where he was born. His caretaker [kahu hanai] was Kameheaiku, and Kuakini grew up at Keauhou, and he was made by his father, Keeaumoku, to pray to the wooden gods; this was Kuakini’s duties in his youth, the worship of the wooden gods. He was the one who cared for all the temples in Kona, along with the Loulu temples, and in regard to his worshiping, one of the names Kuakini was called was Kiipalaoku, for Ku was the god for whom he would fetch pala fern. Kuakini was a thinker from when he was small; he was meticulous; he often would sail boats with the other children in his youth, and when he grew up, he went with his parents to Maui, and thereafter he lived with Kamehameha I. He became an aikane of Kamehameha I, because Kuakini possessed a fine body, he was skilled in English, he thought much about the way a body functions, he was sullen, and was a man of few words. When Kamehameha I died, Liholiho them went to Oahu, and Kuakini was appointed Governor of Hawaii, and it was he that was to care for Hawaii until his recent death. When Kuakini was assisting intently with the kingdom of God, it was he who built the great churches here on Hawaii Island. O Armstrong [Limaikaika], please ask of Thurston [Tatina] or Bishop [Bihopa], for they know what he was like for both of them lived with him. O Father Armstrong, I am living here on Hawaii these months, and will then return to Maui, or perhaps not. D. MALO. Ka Nonanona, Buke 4, Pepa 19, Aoao 89. Ianuari 7, 1845.